With almost all companies showing off their best innovations at the Consumer Electronic Show in Las Vegas, Apple giant aims to showcase its best product. The company is working on a prototype of a new MacBook Air, which will be launched in 2015. We have heard rumors about the new 12-inch MacBook Air for some time now, and according to new information that comes to appear on the side of 9to5mac, the MacBook Air has a new design with the launch of new 12-inch model. The news comes from Mark Gurman, who has, it seems, received information about the new design of the Apple 12-inch MacBook Air. Internally called “Stealth MacBook”, the new MacBook Air will be much thinner than the existing MacBook Air range, the device will be smaller than the current 13-inch model, and also thinner than the current version of 11 inches, it will also lighter. Besides the fact that it is thin, the new 12-inch MacBook Air should also have other design changes, among which include the keyboard and trackpad. The keyboard is changed, and it is at the edges of the laptop. Each key has a narrower space, and some of them are re-positioned to make the narrower laptop. Above the keyboard, there are four grids of speakers that are redesigned and can act as ventilation holes to help cool down the model without a fan. Apple has apparently succeeded in making the device much thinner than current models by introducing a new USB Type-C connector on the left side, and removing a number of ports on the device. This type-C connector would be faster than USB 2.0 and 3.0 integrated on current models and can apparently be used to charge the new MacBook Air, making it unnecessary MagSafe port on the new machine. In other words, the device will only come with a port. In addition, a standard headphone jack with two microphones is positioned on the right side. This would mean that Apple could also launch a kind of hub with the 12-inch MacBook Air, which could be used for additional connections. According to the source, the new MacBook Air will be 6.35 mm smaller than the 11-inch model, and of course the screen is a little bigger. 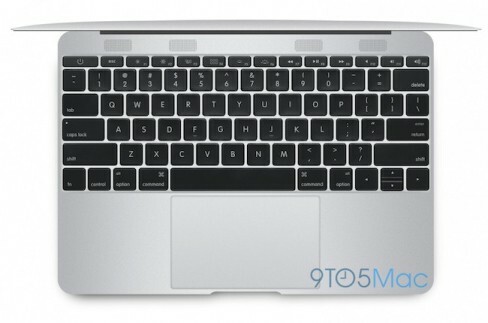 The new MacBook Air is expected to be launched towards the middle of the year.